When considering print finishes for a project, it’s likely you’re going to come across different and sometimes confusing words. Print Design Australia is here to make sense of what print finishes are available and help you select the right one, depending on your project. Perfect binding – a widely used method of binding a book, where the pages are glued together at the spine with a strong adhesive. Common for larger publications or books. Stitching – otherwise known as saddle stitching, is another method of book binding, where staples are used long the spine to hold pages together. Commonly used for projects with larger quantities, more suitable for cost sensitive publications. Print die cutting or forme cutting – these are the same thing, and simply mean to cut out individual print pieces in a desired shape. An essential process in enrolment folders, promotional items, packaging and boxes. Print laminating – the process of adhering a thin plastic film to the top of a printed job to protect the surface or add a matte, gloss or velvet matte finish. We encourage this process on all jobs that require a more professional touch as laminating elevates your product with its tactile feel and increased visual impact. Drilling – the process of creating holes in paper for storage or decorative reasons. Commonly used for creating paper to store in ring binders, swing tags, promotional point of sale material and product labels. UV coating – a shiny and durable liquid gloss coating is applied to the printed material and then cured with ultraviolet light. 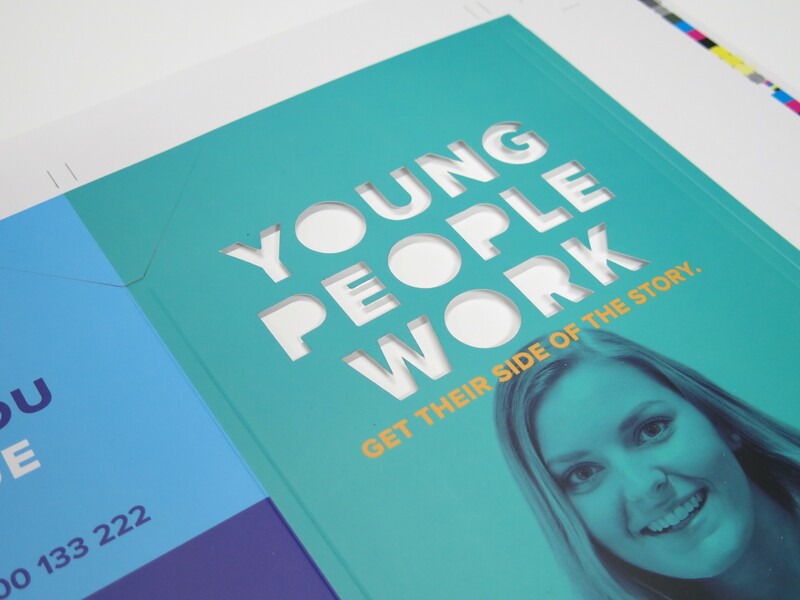 This process adds a professional touch to print collateral that dramatically shifts the perceptions of your brand or organisation. Embossing – a method of producing a raised image in paper or cardboard by applying pressure over a mold. Typically seen in unison with UV coating on projects that require a strong visual. These are just some of the print finishes available in the Print Design Australia workshop. Call and chat with us about your next project. 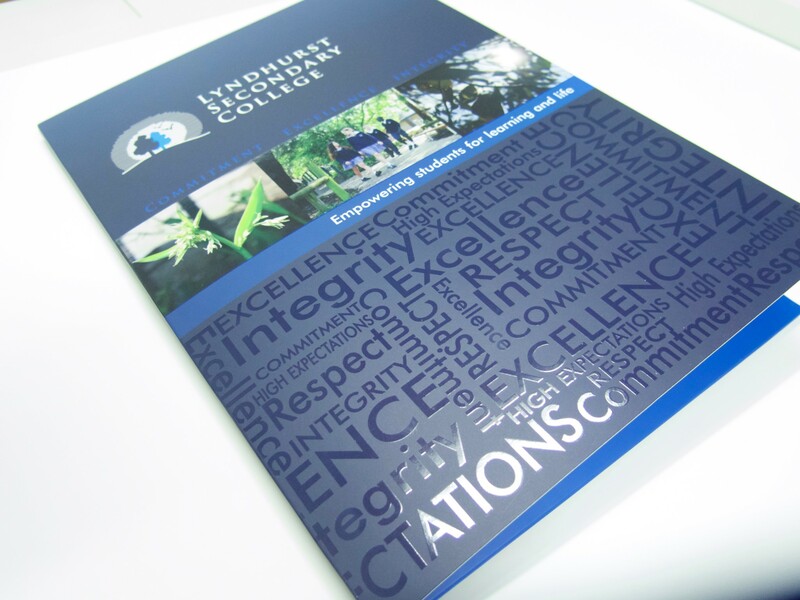 Whether it’s printing for schools or commercial printing you need done, our team guarantees you’ll love the finished result. Folder with Custom Forme Die Cutting. 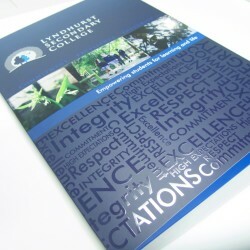 Presentation Folder with ‘Spot UV’ coating.